Rava Uthappa is an instant and healthy breakfast. I got this recipe from a FB group. I always prepare Uthappa where the dosa batter needs fermentation. Never knew that there exists an instant version. I was so eager that I made it on the next day itself. It turned out very good and this made me happy that I got one more dosa recipe to share with you all. The best thing about this dosa is- its healthy because sooji and curd is used in the batter and lots of veggies as toppings. This will be of great help to the working women and bachelors . The dosa is very colorful..hence might attract the kids as well. So what more reasons do you need to try this? :-) Make it soon and enjoy!! For Topping: I used onion, green bell pepper (capsicum), Cilantro (coriander leaves) and tomato. The original recipe told to add red chilli powder, salt and cumin seeds to the chopped veggies. You can also include other veggies of your choice. Take a mixing bowl and add the ingredients- semolina, yogurt, baking soda and salt. Give a good mix and then add water as required till you get a thick batter (of dropping consistency, just like idli batter). I added nearly 1 1/2 cups of water (the amount of water required depends on the thickness of yogurt. The one I used was very thick. Hence I ended using more water). Once everything is mixed, let it rest for 15- 20 minutes. When the batter is resting, chop the veggies finely and then transfer them into a bowl and give a good mix. Now pour a ladel full of batter on the heated dosa pan and spread it (Don't spread the batter too much) Sprinkle the chopped veggies of your choice on the batter (you can as well skip the veggies and make plain, soft dosa). Close it with a lid, until it is fully cooked, on the surface. Then turn it to fry the other side as well. Then transfer it to a plate. Serve it hot, along with coconut chutney. I served it with Udida Chutney. Above measurement serves 3-4 people. Biscuit Rotti is a very popular snack of Mangalore. It is also served for breakfast in many hotels of Mangalore. Biscuit Rotti is a stuffed poori which is very crispy and taste wise- it is little spicy as well as little sweet. Altogether I would say it is one of the best known Mangalore snack. Getting the recipe was not hard for me as my mother's brother own a small hotel in their village. They make this addictive snack everyday. Few years back, me and my mother had tried making it but somehow it didn't turn out crispy. We were not happy with the results and never tried after that. Two years back I tried making it again and it was a total disaster (those were the initial days in my kitchen). Take a mixing bowl and add all purpose flour, sooji, salt and hot oil. Mix it with the help of a spoon. Now add water in small quantities and make a soft, pliable dough ( the dough has to be soft otherwise it becomes difficult to roll after the stuffing is done). Keep the dough covered for half an hour. Heat oil. Then add mustard seeds. Once it starts spluttering, add coarsely ground urad dal and curry leaves. Fry until urad dal turns slight brown. Then add semolina, grated coconut, salt and red chill powder. Mix well. Continue frying this mixture on a medium flame for 3-4 minutes or until you get a nice aroma. Then turn off the heat. Allow the mixture to cool completely. Then add sugar. Mix well. Taste the mixture and at this point you can add more of either red chilli powder or sugar or salt (I made the mixture a little sweeter as we both like it little on the sweeter side. But you are free to make it spicy as well). Filling is ready. First divide the dough into seven equal parts. Roughly divide the filling into seven portions. Then place one portion of the filling in the middle of the rolled poori. Now start sealing the filling by bringing the poor together (just like you do while making puran poli or stuffed paratha). Then start rolling it by dipping in all purpose flour. Be gentle while rolling (Care should be taken while rolling and see that there is no damage in the outer covering. Otherwise the filling will spoil the oil while deep frying). The final size of the stuffed poori should be approximately 5 inches in diameter. Now slowly put this stuffed poori in preheated hot oil. Then gently start pressing the surface of the poori with the help of the ladel (this helps it to puff up). The heat should be medium while frying. This helps in getting a crispy outer crust. Look how it has puffed up after a gentle press at the initial stage. Continue frying on both sides until you get a uniform brown color on both sides. Once got, transfer it to a plate containing paper towel. Allow to to cool for a while. Biscuit Rotti is ready!! Serve it warm as a snack or even for breakfast. Above measurement makes seven big sized biscuit rottis. Udida Chutney is a simple yet delicious chutney. In konkani, Udidu means urad dal. This chutney is basically coconut chutney with added flavors from the roasted urad dal. I got this recipe from a very good friend of mine. He calls it Kempu Chutney, as the chutney has a red color. This chutney was in my to- do list from a very long time. Somehow I never got a chance to make it. This chutney goes well with any kind of dosa or idli. Fry the dry red chillies in few drops of oil. Then transfer it to a plate. In the same pan, fry urad dal in few drops of oil, until it turns light brown. Transfer this to a plate for cooling. Now grind grated coconut, roasted red chillies, tamarind, roasted urad dal and salt along with little water, to get a paste (not too fine). For Seasoning- Heat oil and then add mustard seeds. Once it starts to splutter, add curry leaves and turn off the heat. Add this to the chutney. Udida Chutney is ready!! Magge Bhakri is another popular Konkani flat bread. In konkani, magge means yellow cucumber. The addition of grated yellow cucumber makes it very unique in its taste. My mother used to make it once in a while and she used to say that it was her mother's favorite. You can also try another variety of dosa made using yellow cucumber- Magge Surnali. But this bhakri needs no fermentation and hence you needn't plan a day ago to make this. Remove the seeds and peel of the yellow cucumber . Then grate it. Soak the rice for two hours. Drain the water completely and then grind it until rice rava is formed (the rice grains should not be too coarse/ fine). Now transfer this to a mixing bowl. Then add rest of the ingredients mentioned above except oil and give a good mix. The rice mixture is ready to make bhakris. Now start heating a tawa on a medium flame. Then place a small amount of mixture (size of a ball) and then start spreading it with the help of your hand. Sprinkle little oil/ ghee over the bhakri. Once the base turns golden brown, flip the bhakri so that it gets a golden brown color on other side as well. Once done, transfer it to a plate. Magge Bhakri is ready!! Serve it hot along with chutney, chutney powder or any spicy curry of your choice. Above measurement makes 5-6 bhakris. Masala Nelkadlo is a tasty deep fried snack. In Konkani, nelkadlo means peanut. This is very easy to make and requires only few ingredients. In India(in our village), this is one of the snack which is commonly sold in petty shops. Small packets of these addictive ones are available. In this way even the poor people can afford and enjoy it. Try making this sometime and I am sure you all will love it (especially kids are going to love it). Note: You can add Kashmiri red chill powder to get the bright red color. You can also use Cashew nuts instead of Peanuts. Mix all the ingredients mentioned above except oil. Then sprinkle little water at a time and mix it until everything comes together. Each peanut should be well coated with the besan mixture (the final mixture is very sticky). Fry this mixture in hot oil on a medium flame. Since the mixture is sticky, try to separate the peanuts (as much as you can) as you add into the hot oil (fry it in batches for even frying). Fry it until it turns crispy and golden brown. Transfer it on a paper towel, to drain out the excess oil. Masala Nelkadlo is ready!! Allow it to cool and then transfer it to an air tight container. Hayagreeva is a healthy, jaggery based dessert. It is simple and doesn't require any special skills to make it. This sweet is rich in protein and iron. Hayagreeva can also be offered as a naivedya to god. Fry Chanadal for couple of minutes and then add little less than 2 cups of water and pressure cook it for one whistle. After a whistle, simmer it for two minutes and then turn off the heat. After cooking the chanadal should still hold its shape. But if you want it soft, then go ahead and cook it for two whistles. Once the pressure is gone, again start heating the mixture and add jaggery and let it melt completely. Once it comes to a boil, add the milk and grated coconut and mix well. Continue heating it until the mixture almost turns dry. Then turn off the heat. Now add 2 tsp of ghee and cardamom powder. Mix well. Garnish it with cashews and raisins (fried in ghee). Hayagreeva is ready!! Note: You can use dry grated coconut instead of fresh one. Jeere- Meere Kadi is a very popular konkani dish. It is simple and very easy to make. In Konkani, jeere means cumin seeds and meere means pepper. Kadi is a thick coconut based sauce. I got this recipe from my MIL and was in my to- do list since so many months. Finally got a chance to make it today and it turned out very good. My mother never made this dish but she used to make a very similar dish using dried pomegranate peel. You can find its recipe here. This is a very healthy dish. It makes you feel good especially when you are having a bad cold or cough. In a few drops of ghee, fry whole pepper and cumin seeeds, until they turn slight brown. Allow them to cool on a plate. For Masala: Grind grated coconut, roasted red chillies, tamarind along with roasted cumin seeds and pepper, to get a smooth paste. Add water as required. Transfer this ground mixture to a dish and start heating it. Add salt to taste and adjust the consistency, by adding water ( I made it little thinner than the medium thick consistency). Bring this mixture to a boil and continue heating for 3-4 minutes . Turn off the heat. For Seasoning- Heat oil and add crushed garlic. Fry it until it turns golden brown. Add this to the mixture and mix well. Jeere- Meere Kadi is ready!! Serve it hot as a side dish to rice. Above measurement serves three people. Note: #You can also try roasting (without oil) the grated coconut until it turns pale brown and rest of the procedure remains the same. Roasting imparts a good flavor to the dish. #I have also read in a cook book that you can give mustard seasoning instead of garlic seasoning. Rulao Bhakri is a filling, healthy breakfast. In konkani, rulao means semolina and bhakri is a kind of flat bread which is made by patting. I have already posted my mother's version here. I found this recipe in a cook book (by Jaya V Shenoy). It was slightly different and hence thought of posting it. This bhakri is an instant one and can be made within 15-20 minutes. Try making this version and I am sure you all will love it. I used ghee while frying which added a great flavor and final result was just yum. Just two bhakris will make you feel like you had a very heavy breakfast!! Take a bowl and add semolina, curd, chopped green chill, grated ginger, grated coconut, chopped onion, curry leaves (torn) and salt. Give it a good mix and then add water (in small amount) to get a mixture which is soft (not watery). I added a little less than 1/2 a cup of water. Let this mixture sit for five minutes. Now take a cup of water in a bowl (this will be used in spreading the bhakris). 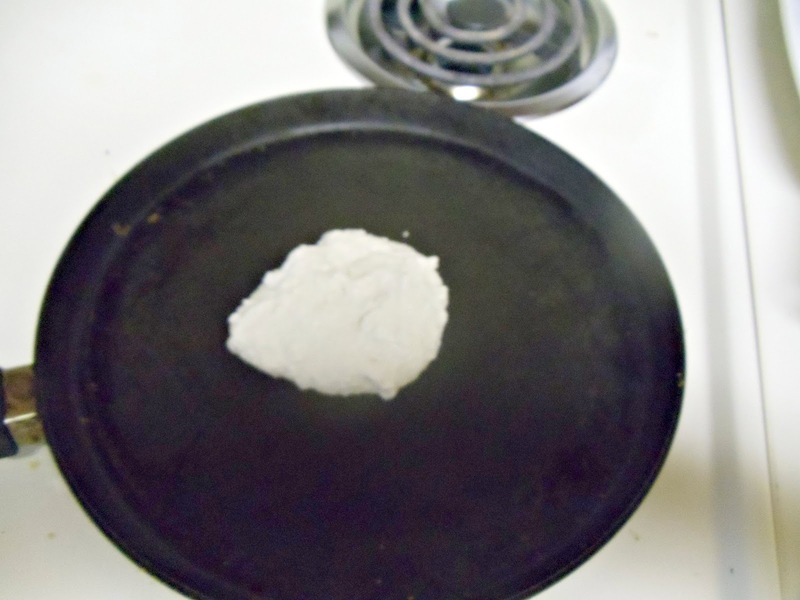 Once the pan gets heated, take a small portion of the batter using your hand and place it in the middle of the pan. Add oil/ ghee while frying. 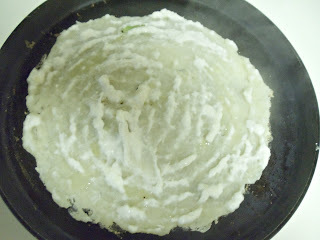 After 1-2 minutes flip the dosa to fry the other side. This might take 1-2 more minutes. Both the sides should get golden brown spots. Rulao Bhakri is ready. Serve it hot. Above measurement makes three big bhakris.